Stem fracture is an uncommon but distinct mode of failure for oncologic implants. It is reported in the arthroplasty literature that cantilever bending forces can lead to metal fatigue and stem fracture [1-5]. This type of loading can be observed with distal femoral and proximal tibial megaprostheses, especially if osseous resorption or stress shielding occur at the level of the initial osteotomy and implant collar. Removal of a well-fixed cemented or pressfit stem that is broken within the canal can be challenging. Standard revision techniques using gouges and flexible osteotomes are typically ineffective. Overreaming the stem with trephines is often unsuccessful for cemented or for bowed stems and are excessively destructive to the remaining cortical bone. Performing an osteotomy along the length of the incarcerated stem may create a cortical fracture. Varying descriptions for cortical fenestration for removal of hip stems have been published [5-9]. The objectives of this study are to 1) report a series of fractured megaprostheses stems about the knee, 2) describe an effective technique for stem removal, and 3) evaluate the effectiveness of this technique for varying revision situations. A retrospective chart review was performed for a single surgeon (EUC) from 1985-2013. 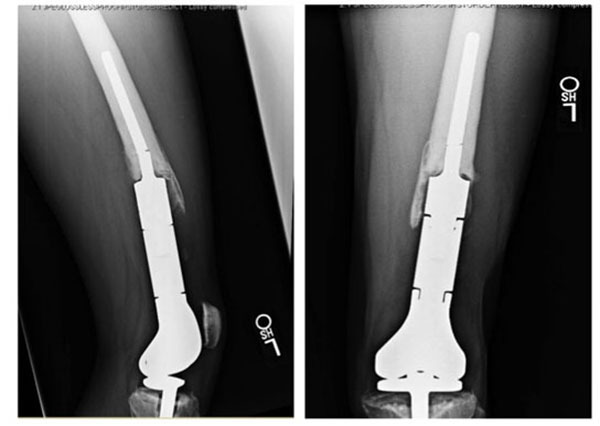 330 adult and pediatric patients were identified as having undergone limb salvage with a megaprosthesis, of which 196 (109 cemented, 87 pressfit) involved the distal femur or proximal tibia. There were 45 revisions. Case details including method of fixation for the primary prostheses, reason for implant failure, and method of stem extraction were recorded. All data were collected in accordance to IRB. 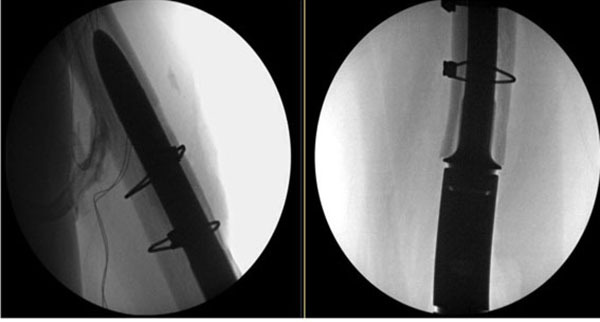 Cortical fenestration was performed in all cases with a fractured stem (Fig. 1) and in select difficult revisions for other etiologies for a total of 12. Using intraoperative fluoroscopy, the level of the cortical window was planned such that a 4 cm or greater length of circumferential intact cortical bone would remain at the end of the bone adjacent to the stem collar. The cortical window would extend in length to near the tip of the stem. A high-speed pneumatic drill with a fine tip was used to perforate the cortex at 5 mm intervals and outline a long oval cortical window. For the femur, the window was placed anteriorly. For the tibia, the window was placed anteromedially or anterolaterally. To avoid compromising the cortical integrity of more than one side of the bone, the width of the window was limited to the width of the intramedullary canal. An approximately 10-20 mm osteotome was used to carefully complete the window. Fig. (1). Lateral and anteroposterior radiographs of a broken stem. Once the window was removed, a high-speed burr with a wire-passer tip was used to remove any easily visible cement Fig. (2). An ultrasonic cement removal device such as the Ultra- Drive® (Biomet, Warsaw, IN) or OSCAR® (Orthosonics, Chatham, NJ) was used to remove cement from the sides of the implant and within the canal. A burr was used in the window to create a transverse divot in the stem such that an osteotome could be placed into the divot and the entire stem be driven retrograde out of the canal using a mallet and the osteotome. After the stem was removed, the remaining cement was removed with the ultrasonic device. It should be noted that the ultrasonic device was also effective at disrupting osseous ingrowth fixation for pressfit stems. Fig. (2). Intraoperative photo of the cortical window after extraction of a broken stem. Fig. (3). Intraoperative photo of revision components with refixation of cortical window. A long pressfit stem that bypassed the cortical window by at least 4 cm was typically used for reconstruction. The cortical window was fixed with two cerclage cables prior to placement of the final stem Fig. (3). If the new implant was cemented, bone wax was placed around the edges of the window to prevent cement extravasation. The collar of the new stem was seated into cortical bone to minimize a “flagpole” phenomenon and bending forces on the stem. Postoperatively, patients were kept partial weight-bearing for 6 weeks if no cortical fenestration was needed and 12 weeks if cortical fenestration had been performed. Postoperative radiographs were obtained to document the integrity of the cortical window (Fig. 4). 27% (29 of 109) of cemented and 18% (16 of 87) of pressfit prostheses were revised for stem failure. The reasons for revision in the cemented group were loosening (62%), infection (24%), and stem fracture (13%). In the pressfit group, the reasons were loosening (43%), infection (31%), stem fracture (6%), limb-length discrepancy (6%), malrotation (6%), and local recurrence (6%). A cortical window was used in 10 of 45 initial revisions (7 cemented, 3 pressfit) including all of the stem fractures, and in 2 of 15 subsequent re-revisions. Fig. (4). Lateral and Anteroposterior Radiographs Postoperatively. 17% (2 of 12) revision cases in which a cortical window was used required subsequent re-revision for infection (8%) and for loosening (8%). Rerevision was necessary in 33% (16 of 48) cases in which no cortical window was used to remove the failed stem. The reasons for re revision in the cases without a cortical window were loosening (25%; 12 of 48) and infection (8%; 4 of 48). Stem fracture due to cantilever bending and inadequate proximal bone support is a well- known phenomenon in total hip arthroplasty, but it is less studied in megaprostheses around the knee. Improved manufacturing technology and larger stem diameter may reduce the rate of this complication. It can be challenging to remove a wellfixed or wellcemented fractured stem while preserving the remaining bone stock for further reconstruction. If the stem is bowed, conventional techniques such as hollow trephine reamers or flexible osteotomes are not reliable. If the stem is broken, it is typically countersunk within the diaphysis, retrograde techniques are ineffective, and some type of cortical fenestration is required for exposure. In this series of 40 revision cases spanning more than three decades, stem fracture was responsible for approximately 10% of stem revision cases. This is lower than the 24% for distal femoral and proximal tibial replacements reported by Schwartz et al. . The cortical fenestration technique described here provides a consistent, reproducible method to remove the stem and allow for reliable placement of a competent stem. It is associated with low rates of subsequent loosening and no increase in periprosthetic fractures. Pierson JL, Crowninshield RD, Earles DR. 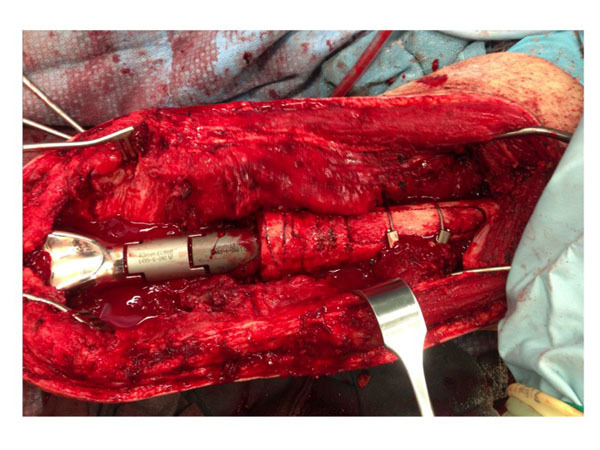 Fatigue fracture of a modular revision femoral component: a report of forty cases. In: 14th Annual Meeting of the American Association of HIp and Knee Surgeons. ; Dallas, TX. 2004. Crowninshield RD, Maloney WJ, Wentz DH, Levine DL. The role of proximal femoral support in stress development within hip prostheses. Clin Orthop Relat Res 2004; (420): 176-80. Lombardi AV Jr. The cementless calcar: a proximal solution. Orthopedics 2005; 28(9): 963-4. Woolson ST, Milbauer JP, Bobyn JD, Yue S, Maloney WJ. Fatigue fracture of a forged cobalt-chromium-molybdenum femoral component inserted with cement. A report of ten cases. J Bone Joint Surg Am 1997; 79(12): 1842-8. Glassman AH, Engh CA. 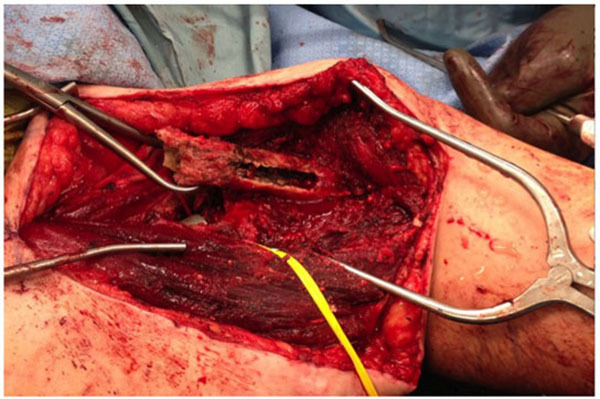 The removal of porous-coated femoral hip stems. Clin Orthop Relat Res 1992; (285): 164-80. Piyakunmala K, Sangkomkamhang T, Chareonchonvanitch K. Rail road proximal femoral osteotomy: a new technique to remove well-fixed femoral stem or cement mantle in revision total hip arthroplasty. J Med Assoc Thai 2009; 92(Suppl. 6): S152-5. Kim YM, Lim ST, Yoo JJ, Kim HJ. Removal of a well-fixed cementless femoral stem using a microsagittal saw. J Arthroplasty 2003; 18(4): 511-2. Kang PD, Yang J, Shen B, Zhou ZK, Pei FX. Cortical windowing of the femoral diaphysis for cement/plug removal in hip revision surgery. Zhonghua Wai Ke Za Zhi 2010; 48(14): 1060-4. Arif M, Sivananthan S, Choon DS. Revision of total hip arthroplasty using an anterior cortical window, extensive strut allografts, and an impaction graft: follow-up study. J Orthop Surg (Hong Kong) 2004; 12(1): 25-30. Schwartz AJ, Kabo JM, Eilber FC, Eilber FR, Eckardt JJ. Cemented distal femoral endoprostheses for musculoskeletal tumor: improved survival of modular versus custom implants. Clin Orthop Relat Res 2010; 468(8): 2198-210.